Ooblets seems to check off a lot of my boxes. I'll need to keep an eye on that. *The Intel Grand Slam- "The Grand Slam is a thing used in Tennis, golf and rugby." Er... aren't you forgetting one major usage? You are, of course, referring to the Denny's Grand Slam breakfast! I was interested when I read the description. Then I saw the trailer and it looks like they are aiming for a younger audience. Even younger than I anticipated. *Rabbids! And a Mario coin cube. This would be the Mario vs. Rabbids Tactical game for the Switch. Yes, it's a real thing. And Shigeru Miyamoto arrives on stage. There's a photo op. It's cute. Mario+ Rabbids: Kingdom Battle. And that might be the first toilet in a Mario game. *Assassin's Creed Origins. And the trailer continues Ubi's string of "music that doesn't really fit the setting" as it sounds more appropriate for the Blind Boys of Alabama rather than Ancient Egypt. *Sirens. Cars. I'm guessing The Crew 2 here. And I'm correct. Looks very racing. *Lightning. South Park. Oct 17. No Trey and Matt this time though. Hmmmm. Ubi might not want to be poking the tiger on this. *A new surprise from Ubi Singapore.Set in 1721. Pirates? Holy cow. It is about pirates. Are they actually listening to folks cries for more Black Flag? Skull & Bones. Well, that's pretty damn close. And then they say "it's a shared world." Team based piracy. Noooooo! Just let me shoot ships solo! I don't want to deal with other people! Well, more pirate stuff for the Black Flag crowd. And Ubi is doing annoying stuff. Intro teaser. Person talking. Gameplay. Trailer again. You can cut one of those trailers out guys. *Oh, dancing. Joy. Just Dance. Yes the dancing panda is back. As well as J-Pop. And some poor pop star they dragged out there. *And a South Park mobile game. With Cowboys. South Park: Phone Destroyer. Huh. Trey and Matt do not like phone games. At all. *Off to space. It's a Skylanders-ish game, but with buildable spaceships. Starlink Battle for Atlas. *Steep. Which had fallen off the face of the Earth. But it's getting an expansion in September. Right now 84 people are playing Steep on Steam. For comparison, 1500 people are playing FTL, which is a half decade older and niche. *Off to Montana for some Far Cry 5. It has a dog that brings you guns. Like AK-47s in its mouth. With that it becomes a must buy. *And a monkey with a British accent. And a jet pack. Scamming a giant pig. The graphics are amazing BTW. It's Beyond Good and Evil 2! Holy cow! They have poured some serious cash into it! Up next- Sony in about 4 hours. Dragon body slamming a T-Rex Hype! 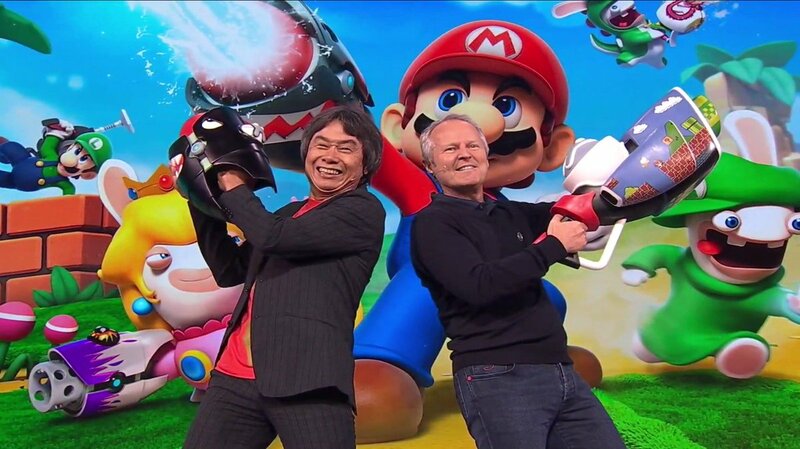 I had no interest in the Rabbids/Mario crossover until I heard it's going to be a tactical game. Now I think I have to. And the big announcement from Ubi. I guess I don't have a problem with it, but I wouldn't have picked Beyond Good and Evil 2 as the E3 trailer with the most F-Bombs. wait, they're making a denny's simulator? is one level where you have to be able to order while completely hammered? Leaked ahead of the Sony conference- Ni No Kuni 2 will be out in November. A retro console ala last years mini-NES maybe? Those already exist for the Atari consoles. So what is this? Really? That was the best idea you could come up with? Well, it will just be another Nintendo game I'll never play. The last Nintendo console I bought was the SNES. Start porting your games to PC.. or don't. That's why emulation exists. Shown in the lead up to the show is a PS4/Vita version of Undertale, in case you don't have a PC that can run it. Or a toaster than can run it. Neat looking collector's edition of it though. *Sony's got their orchestra back, this time playing Indian themed music. Is Ghandi about to nuke me? Have I slipped back to the late 60s and the Beatles are in their Indian phase? Is Sony just steaming the wrong thing? Oh, video. And the Uncharted ladies. With no audio. Off to a good start. Uncharted: The Lost Legacy. It's lost. Just like the sound. *Something from Guerilla. Some Horizon DLC. Sound still borked. Horizon: The Frozen Wild. Okay, Twitch and all other off-site sources have no sound. The only live one with good sound is Sony's direct feed. Folks are quite aggrieved. *In the meantime, something with bikers. And mutant dogs. Days Gone, that zombie game from last year. Oh, and a mutant bear. Idiots in the crowd doing the "we're not worthy" thing. For Days Gone. Really? * Oh, someone from Sony arrives to babble. Here are games we've made! VR! Stuff! Franchises! *"A title beloved by people around the world." Grabbed by the Ghoulies? Crash Band... Oh. Someone with an anime sized sword. Hey a Tyrannosaur. Or an approximation of one. Capcom presents Monster Hunter World. Huh. I thought Nintendo had the rights to all those. Guess not. Next year. *Japan Studio. That the actual studio title, not me trying to be cute. Giant creatures and running up them. Shadow of the Colossus? Wait. A remake or remaster? Future Me: It's called Shadow of the Colossus Remastered Remastered. Yes, that's the title. *More Capcom. Marvel vs. Capcom Infinite. With story elements? Going after that Injustice market? Sept 19.with a Story Demo available now. And Dante gives Rocket his guns to play with. Heh. *Normandy. Arnhem. I'm guessing Call of Duty:WW2 here. And the music does not scream WW2 at all. And folks are dual wielding. In WW2. Nov 3. *And a VR headset. And first up Skyrim VR. I'll wave bye bye to some of my friends now who will retreat into this and never leave. *Still in VR- With a lot of neon it's a side scroller. A VR Side Scroller. That's like a VR card game. Star Child. *From Supermassive- something with 1950s music. The Inpatient. You're trapped in an asylum! Fun! *VR Fishing! With the Final Fantasy XV characters! This isn't sarcasm! Monster of the Deep! In September! *More Supermassive- Bravo Team. A VR shooter. *Still in VR- Polyarc. You've got a book! A magic book! And a mouse! These are ex-Bungie folks, BTW. Looks like Mouse Guard crossed with an adventure game. Moss. Doesn't really seem to make use of the whole VR thing though. *It's a PS4 image. And then sounds of water. And shots of the crowd. Not helping, idiot camera people. And Kratos is in a boat. If this is a Kratos VR fishing game.... Well, the kid is there so this must be the real game. God of War in early 2018. *And someone arrives to sing. Lovely voice. It's that Detroit game. "Detroit" with the robots. "We're going to set our people free!" You were made in a factory, you know. Anyway it's an android rebellion! A mechanized melee! A robot riot! I'm going to rip out your CPU and show it to you still processing! Thank you Love Handel. Let's see how David Cage does on this one. *Destiny 2. Sept 6. With exclusive stuff on PS4. *The Sony guy returns. A true exclusive for PS. It's a city! And the Spidey music plays. Sony drags a second screen onto the stage for reasons. Looks comparable to the better Spidey games, but we'll see. But this is a trailer with a lot of scripted events. Let's see how the full game goes. 2018. And that's it. Wow. Really? No Last of Us 2? No Gran Turismo? Kingdom Hearts 3? Crash Bandicoot? Anything? Nope. That's it. Just trailers. A few bits of gameplay for Days Gone and more for Spidey. No real humans out there either except for 5 musicians and Sony guy. But just trailers here, and not even very well done. Okay, last up is Nintendo in about 12 hours. Oh, I guess Monster Hunter World is a big deal to the Monster Hunter fans, but I'm not in that group. Also, it's coming to PC and Xb1 too. Atari's been quietly releasing new iterations of the Atari Flashback every couple years since long before the NES Classic made everyone crazy for the concept. I bought the Flashback 2 back when there were 30 games. This latest version has 120. I'm guessing they want to ride the frenzy that was generated by the NES Classic, but it's really, REALLY hard to get gamers interested in Atari unless they were there. EDIT: Wait that's not the trailer I assumed it was. The Ataribox? They just finished hyping the Flashback 8. What the heck would this thing be, then? A note I'm hearing from folks I know on the show floor. A number are saying that we you see stuff on stream, it looks okay. But when you see them on a monitor or TV they look incredible. The limitations of band width may not be doing some of the games justice. Or the games might be running on optimized systems and the best monitors. We won't really know until the games hit.